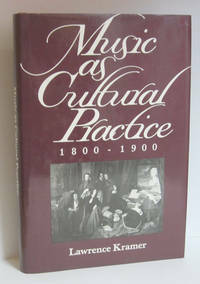 Music as Cultural Practice: 1800–1900. Berkeley: University of California Press, 1990. 1st ed.. Hardcover. Very Good/Very Good. Octavo. xv, 226 pp. Very good in very good dust jacket. With 4 illustrations and 28 musical examples. Berkeley: University of California Press, 1990. Contents: 1. Tropes and Windows: An Outline of Musical Hermeneutics; 2. Beethovens Two-Movement Piano Sonatas and the Utopia of Romantic Esthetics; 3. Impossible Objects: Apparitions, Reclining Nudes, and Chopin's Prelude in A Minor; 4. Liszt, Goethe, and the Discourse of Gender; 5. Musical Form and Fin-De-Siècle Sexuality; 6. "As If a Voice Were in Them": Music, Narrative, and Deconstruction. Series: California studies in 19th century music, Vol. 8.